Richard and Tanya Quilts: Have you ever had one of those days or weekends? Tanya over the weekend asked me to sew together a rag quilt for her as her machine just hates the thickness of the quilts. 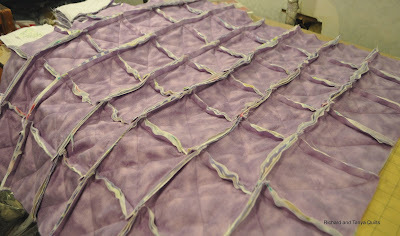 I had all the rows sewn and was about to sew the rows together when I realized that I made a mistake. 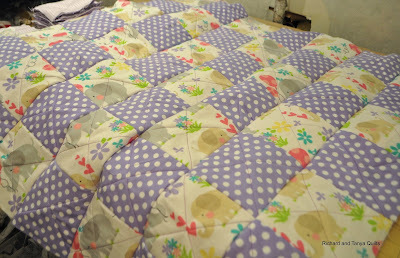 As you can see in the pictures above the quilt looks cute and all but the back that is solid purple has the rag part of the rag quilt. Talk about having a bad day. I used a locking stitch, so a seam ripper really wasn't an option with flannel. To make things worse earlier in the day I was finishing the quilting on my diagonal top. It was looking just fantastic. 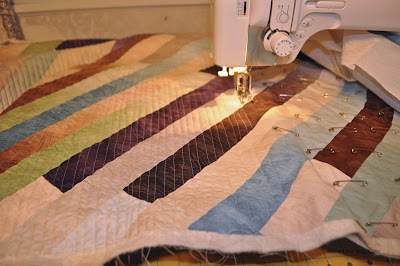 I was quilting rows side by side and it was taking me a lot of time with as much stitching as there was. As you can see it was looking fantastic then I ran into a little snag. No really, I snagged my finger on one of the pins in the quilt. Yes those little red dots are me bleeding all over my wonderful quilt. I wanted to cry. Tanya tells me she will try to fix it, but instead of a nice quilt to sell I might have a quilt for myself. 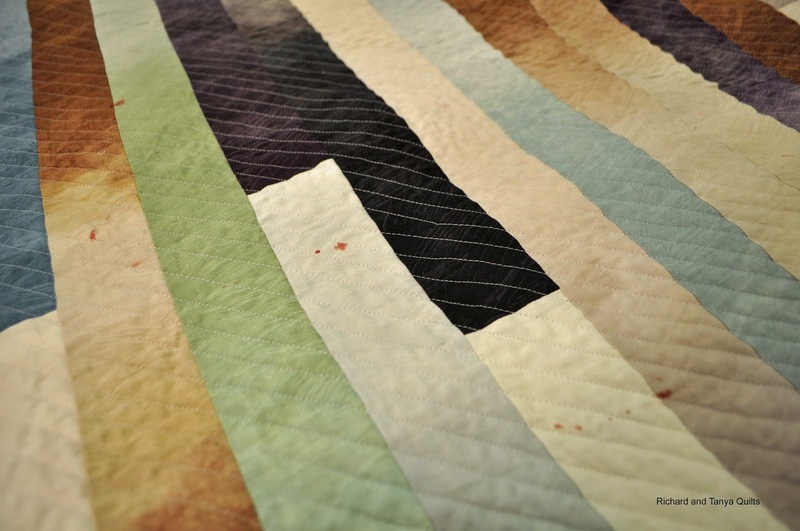 Have any of you bleed on one of your quilts before? I was bleeding for a little while, before I noticed it which is why its all over the place. Speaking of wanting to cry my old friend Fire in the Sky that I have had listed on Etsy sold. I was so sad to see that I sold it. I know when you sell something you are suppose to be happy. This quilt was in 22 treasuries and had 99 admire and that does not count me. So today I cry as Tanya puts it into a box and ships it away. I have poked my fingers many times when hand quilting. This is not very nice, I guess, but the quilting wisdom is to use your own spit to remove the blood. An enzyme cleaner might work, too. Good luck! I second Laura, your own spit removes your own blood pretty well, especially if it hasn't set yet, so good luck. We used that as often as needed when I used to work in a bridal shop--blood on wedding gowns is no bueno. Hydrogen peroxide is good too, just be sure to rinse it out afterwards and don't let it sit too long. Also, sorry about the rag quilt. That would be SO frustrating. Grasshopper had lots of bloody noses when he was little. Wash it in cold water, pre-treating it beforehand with a stain spray (I use Shout). Even if it has sat for a while (as in, you can finish the quilt), it should come out. If you're worried, use an old toothbrush to gently scrub the spots a little before you throw it in the wash. Check your quilt before you dry it, and if any stains remain, try a little hydrogen peroxide on it, but I would use that as a last resort because it could pull some of the dye out of the fabric and leave "bleached" spots. Hydrogen peroxide will get the blood out. Pour a bit on the stop and it will fizz up. Dab fizz off with dry cloth or paper towel. Repeat until clean. Works like a charm. Yep, I agree with Laura also. Use your own spit next time (before the blood dries.) Take the time to get a bandaid. It's worth it. 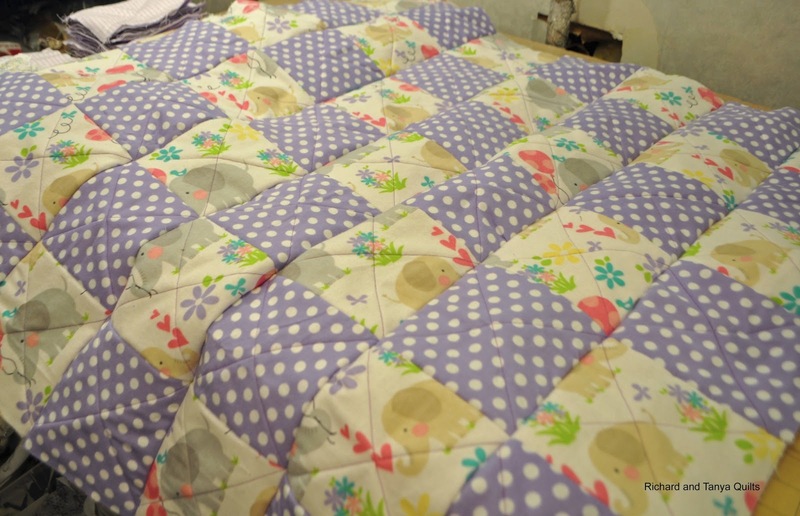 I think the rag quilt is cute with the rag part on the wrong side. Others may have thought it was a "design choice". Hope today is better. Peroxide works great on blood stains. I am in the peroxide camp for blood removal. All the nurses I work with swear by it. I think you should just alternate the rows on the rag quilt (if it isn't too late) and have a semi modern rag quilt. Hi Richard. I'm sorry about your quilt. I do a lot of hand quilting so I have blead on a quilt before. I use plain old Dawn dish detergent. It works great for anything--blood, spots, or whatever. Also, your rag quilt is very pretty and colorful. I think it will be fine just the way it is because it can be reverseable. (I know this from my own mistakes -and we all do make them, even someone that has been sewing as long as I have) If you wanted too, you could add some applique to some of the purple blocks,but it will be very cute without it. I'm in the your own spit camp...and then if it's dried I use this wonderful ECover Stain Remover...I buy at Whole Foods. It has never failed me, whereas every other stain remover has failed at some point in the past. I swear by it. The quilting is going well! The blood will come out! So the solid side gets ragged and the colorful side becomes the back. =) Not the original plan, but it still works. Love the stitching on your bloody quilt. I'm sure you've figured out a way to get it out, from the suggestions given to you. Oh, yes, as quilters we all have bad days. I have learned to stop while I am ahead when I just can't get things right. I hope you were able to get the blood out. I really like that quilt. 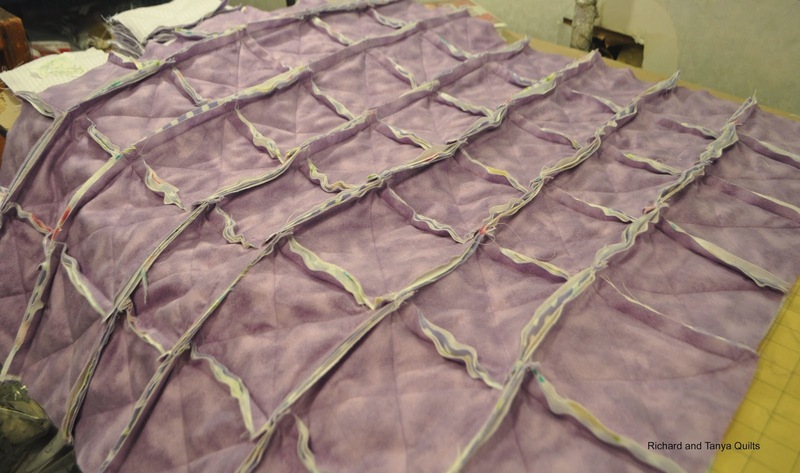 The hardest part of making a quilt is turning it loose. Sorry about the blood. If you can find it, try Resolve Dual Power Oxi Stain. It is for carpets, but, it works great on blood stains. I spent a whole summer using it on most of my son's clothes to get out the blood. It worked every time. I didn't realize till the end of the summer that it was for carpets (it was sold next to the fabric stain removers by accident). Good luck! The blood just adds character to the quilt. As others have said, Hydrogen peroxide will take it right out. I have not bled on one of my quilts yet, but I have put a needle through a finger or two when machine embroidering. It doesn't feel good. Wow, I think if someone says they can't relate, they aren't telling the truth. Fortunately, tomorrow is another day!! I find Tide works like a charm on blood. But it seems as though you've got lots of options from all the great comments here.